Air France has dropped the price of their flights from Montreal to Port Louis, Mauritius down to $658 CAD roundtrip including taxes. The flights have 1 stop each way, in Paris, France. This is a *very* unusual price, as it's virtually always quite expensive to fly to Mauritius. It's not uncommon to pay $1600 to $1800 roundtrip. These are also the fastest flights from Montreal to Mauritius. 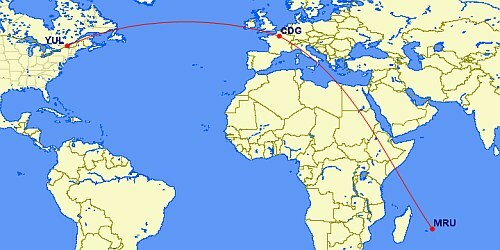 If you're wondering where Mauritius might be, well, it's a *long* ways from Montreal. It's a 15,000km journey, to an island off the Eastern side of Africa, that's even 1,000km past Madagascar! 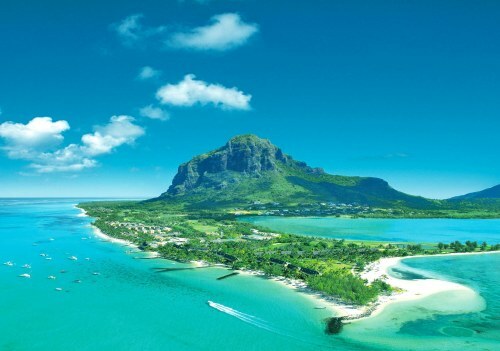 Unlike Bora Bora however, rooms don't cost $600/night in Mauritius. A glance at Airbnb shows that the average rental in Mauritius is a much more reasonable $128 CAD /night. From everything I've Googled, Mauritius does not have Zika. Note that January to March is Mauritius's wet / cyclone season. The island has a classic tropical climate with warm weather year-round. Even in winter, from May to October, the temperature drops from hot to balmy. During summer, from November to April, the days are hot and humid. NOTE: These dates are just examples. There are all kinds of date combinations available. Long trips, short trips, etc. These dates will just get you started. You can also try mixing and matching dates from different lines in the list below. NOTE: Once your Flighthub search completes, you can try clicking on the 'Flexible Dates' tab to look for other cheap date combinations. 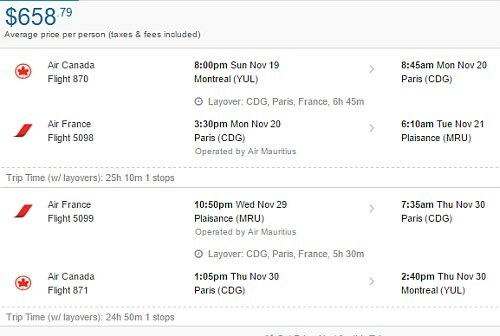 montreal, yul, flight deals, africa, eastern africa, plaisance and mauritius.